Basho4Humanity | Bonding the Generations ( The Human Story: ) | English collection of Basho's linked verse, tanka, haiku, letters, prose, letters, and spoken word about humanity - with commentaries to enable the ordinary reader to understand and enjoy Basho's words. Human bonding is the formation of a close, interpersonal relationship. In his 1935 paper "The Nature of the Child's Tie to his Mother," British developmental psychologist John Bowlby was the first social scientist to interpret the nature of emotional attachment between mother (or principal caregiver) and child. Bowlby realized that bonding gives the child ‘a safe place to stand’ upon which the brain can develop emotional stability, intelligence, and other human virtues. Two and a half centuries before Bowlby, Basho through poetry explored the nature of bonding between children and mothers, fathers, grandparents or wet-nurses; these verses are among his most humane and life-affirming works, the works we should pay attention to when we decide the sort of person he was. I hope developmental psychologists and other social scientists will add these verses to their field of study -- so Basho will further the understanding of human bonding. This woman has enough work sewing before winter comes. She may “make ends meet” in autumn, but has to survive the whole year. Into this poor struggling home, Basho introduces a daughter and a koto, or 13-string harp, an instrument of refinement played only by women. If the mother owns a koto, she must have been well-off in the past, but fallen on hard times. Notice the link between the form of needlework and the strings and frets on the harp. Both stanzas convey the diligence and constant effort of the female, the action of her hands producing harmony, rhythm, and beauty. In human cultures worldwide, age seven is considered the beginning of moral understanding and wisdom, a truth which may help us understand the link between the two stanzas. We imagine the pride the hard-working mother feels hearing her daughter produce such beauty. With utmost subtlety and grace, through the powerful effect music has on the brain, Basho portrays the bond between mother and daughter, the hope for a better future that the growing and learning girl evokes in her mother, hope rising upon the lovely notes from her seven-year-old fingers on the koto. The moonlight conveys the feelings in the child’s heart along with memories of mother working in desperation to raise us in spite of poverty. So the pair portrays not only mother, but also the bond between the speaker and mother. 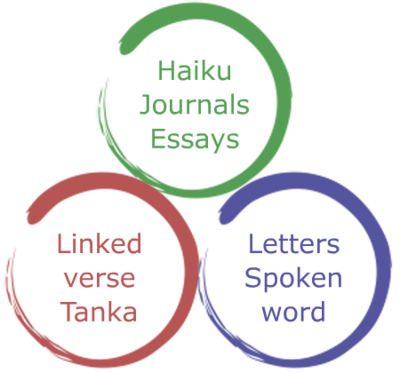 The link -- the thoughts that take us – from Iugen’s stanza to Basho’s reveals the vast range of Basho’s genius. Only Basho could create a link such as this, so personal and bodily, yet so full of female heart. The Mona Lisa rests her hands motionless on her lap – as does Whistler’s Mother. The hands of Michelangelo’s Pieta hold the dead Jesus on her lap. Basho surpasses these maternal icons by giving the hands of the eternal mother activity and consciousness. The newest student at an archery dojo kneels on the floor, feeling small and weak. Connecting to this puzzle piece, we add an image of the dojo where tall powerful men strut about with dangerous weapons, making the boy feel the way he does. The next piece to add is his kneeling position, hizamazuki, hips resting on heels propped up on feet with toes forward, a position of alert readiness; he struggles to keep his slender back and shoulders straight, with all the resolution he can muster against the intimidation. The white hair shows in long horizontal gaps between thin bamboo stalks tied in parallel; this belongs to the boy’s grandfather who hides behind the screen to watch without the boy knowing. He knows that his grandson must not see him, for this would interfere with his training. How does he know this? Granddad (in my jigsaw puzzle) is an accomplished archer – in Japanese, a shihan – who has trained in this dojo since he was a child. With the final piece, the fulfillment of this thread, as the old man watches, he sees himself young and helpless 50 years ago today; he sees the entire process from skinny little boy to aged master. So we cooperate with the poet to fulfill his vision. With the missing pieces filled in, the two stanzas express a profound human truth: the grandparent’s compassionate concern for a grandchild, a bond which passes through to the third generation. Father died in war when I was small, and I have grown up under the weight of that grief. Now, in the prime of youthful 18 year old vigor, I look back over those years of dreams, both asleep and awake, reverting to that one moment on a battlefield I have never seen in reality. Can this verse, written three and a half centuries ago in a very different society, reach the heart of a teenager – male or female -- whose father (or mother) died in Iraq, Afghanistan, or anywhere beset by war or terroism? I encourage teenagers who have lost a parent to explore this verse, especially as you approach eighteen. I hope counselors who work with bereaved teenagers will show the verse and commentary to them. Basho’s clear, straight-forward expression of personal feeling may be consoling. She plays a three-stringed shamisen, so to Japanese thought must be a geisha, or performance artist who travels about singing and dancing. “She scratches her scalp” in difficulty understanding or accepting her fate: the death of her daughter, the three needs conflicting within her, to nurture the infant, to make a living, and to rest her aging body. The ever-present conflict of these needs drives her to distraction – thus she absent-mindedly uses her tool for strumming strings to scratch her head. She emerges from fertile mud to nourish her child from her breasts. This young peasant woman’s entire body is soiled and roughened by everyday exposure to dirt and mud, with only hard mineral-laden water for washing. Still, she tries to keep her face clean and pretty, for baby to behold. She breastfeeds with hope, hope that this baby will escape the constant work and dirt of village life to a prosperous future; she feels her bond with both the fertile earth and with the baby who came from her own fertility. Floating grasses go wherever the water takes them, symbolizing human life carried along without permanence – but tied together neatly with skill provide a firm steady rest for the head asleep. In harmony with “floating,” Basho enters the world of woman divers to present the most substantial and eternal of all human relationships, the bond between milk-giver and heart-receiver, the anchor which holds the mind steady. I have been given to a temple to become a monk; the priest in charge sends the clothing I no longer need to my former home; from now on, I will only wear monk’s robes. As my clothing goes back to my mother, so do my thoughts. Even as I “leave the world,” she continues to be part of me. My face is made from the same genes as her face, so of course they are similar; this is fascinating – in Japanese, yukashi, “it attracts me.” As Gregor Mendel studied peas to discover the nature of descent through generations, Basho is drawn to recognize in the human face the bond between mother and child. The female hands gently separating the countless tiny roots of the seedlings from the dirt of the nursery bed, careful not to damage them, are the same hands which centuries ago rubbed dye onto cloth: the same hands – the same DNA, the same precision and delicacy – inherited from mother to daughter in this village in the heartlands. Basho praises the three layers of this family. The vivid colors– darker orange persimmons, the more yellow mandarin oranges – are the fruits of their labor, the years and years of work -- planting fruit trees, building houses, starting businesses - to produce the prosperity of those not even born when that work was done. The generations are bonded through the annual succession of tree fruits. The spectrum – red outside, inner violet -- appears when sunlight refracting through water in the air causes us to see colors not really there. The poet blends the splendor of optical illusion with cold hard rock, yet no hint of humanity – then Basho blends earth and sky in an expression of the glory of human life. First he presents a vivid physical image of a bond being broken, then reveals that this bond is between baby and mother (or nurse), a bond which lasts till one of them dies. At the moment of death, the spirit parts from the body -- as the colorful kite leaves earth. Life, like bright colors on the dull rock, is only an illusion, sometime to disappear. “Pray to this lock of mother’s white hair.. .
An umbilical cord is the physical remains of his connection to mother. “My native place” is the place on Mother Earth where he was born and grew up. “End of the year” suggests the passage of time during which bonds to mother and native place have continued. 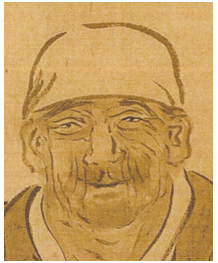 The double meanings – layers of kimono, of years, of generations; wrinkles in kimono and in skin -- overlap to form a web of blessing and hope for Kasane and all female children. Speaking to the newborn: now your time begins, stretching to infinity before unfocused eyes. Soon you’ll be laughing and playing in the sunshine – that is, if no wars come and natural disasters, fatal illness, and financial ruin stay away too. 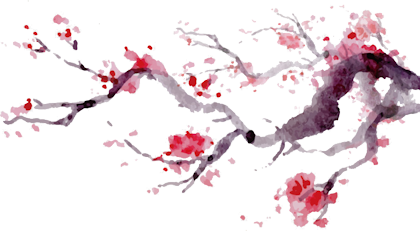 One spring in youth, your mother will give your first blossom-kimono, a bright and colorful robe you wear just once a year to view cherry blossoms with family and friends, then fold up and store away till next year. The springs shall come and go with clouds of pink blossoms filling the treetops to fall in a shower of petals as you blossom into a young lady. Kasane, I pray for your life to be without misfortune, so the day comes for you to pass this youthful kimono onto your daughter, the next “layer” of yourself, while you wear one more moderate in color and pattern – and she has a daughter to pass the kimono onto, while you wear the darker sedate kimono of an older woman. Female self, daughter, and grand-daughter are bonded through the annual succession of cherry blossom celebrations, as well as through the succession of blossom kimono worn at those celebrations.